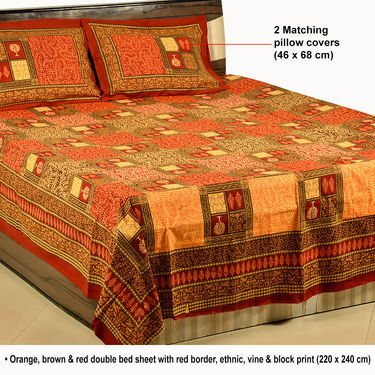 Introduce a play of myriad colours, patterns and designs to your bedroom decor with these Jaipuri 4 Double & 4 Single Cotton Bed Sheets. 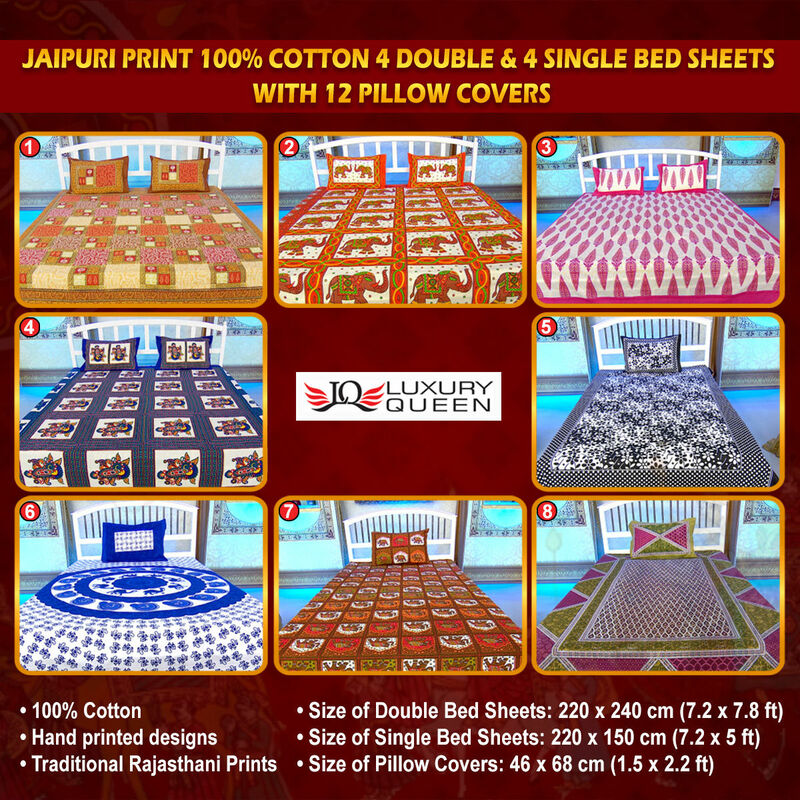 A perfect confluence of the modern and traditional, these bedsheets feature the immensely popular traditional Rajasthani printed bed sheets from the flamboyant city of Jaipur which is known for it's artistic history in bed linen. 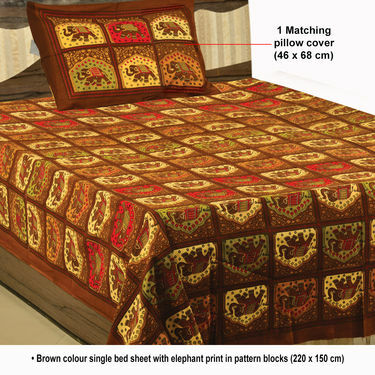 Made of pure cotton, the prints are hand printed, ethnic and add a touch of old world charm to your room decor. 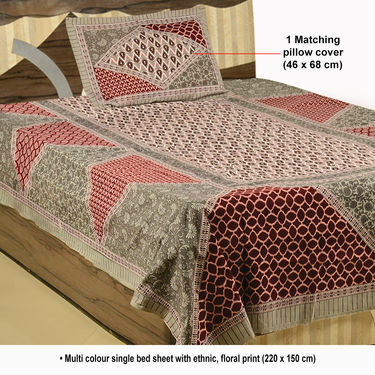 You also get matching pillow covers with these double and single bedsheets. Warranty: 7 Days Warranty Against Manufacturing Defects. 4 Single Bed Sheets with 4 Pillow Covers. Looking to give your bedroom decor a twist? Are you in the mood for ethnicity and wish to turn your bedroom into a throbbing, vibrant retreat? 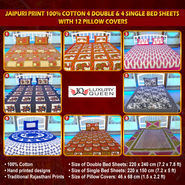 Well, we at Naaptol have just what you might be having in your mind?s eye - the Jaipuri Printed 4 Double & 4 Single Cotton Bed Sheets with 12 Pillow Covers. The rich cultural heritage of Rajasthan is known to all. Textile handicrafts from Jaipur include clothes, curtains, table clothes, bags, carpets, bed linens and many more. The design, pattern and colour combinations in all these hand crafted items are a perfect blend the modern and the traditional. 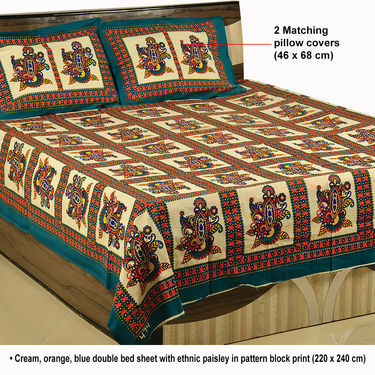 Likewise, these double and single Jaipuri cotton bedsheets look contemporary yet ethnic. 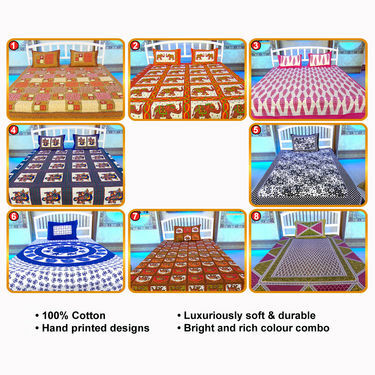 Made with 100% pure cotton, these bedsheets not only look colourful, they are also extremely comfortable, breathable, and skin-friendly ensuring a good night?s sleep for you. These bed sheets come with matching pillow covers. As far as colours and patterns are concerned, bold patterns and colors are popular. 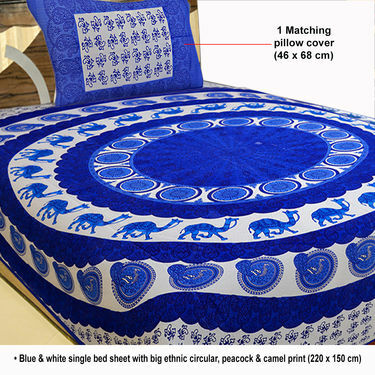 These bedspreads feature hand printed designs comprising paisley, block prints, animal prints like elephants, camel, floral and circular prints. You get to enjoy an array of bright colours to play with while setting up your bedroom or even your living room decor with a diwan/ottoman. The hand printing is done through a long standing tradition of using cut vegetables like potato and carrot pieces or teakwood carved blocks. Often these finished products emit pleasant odours. 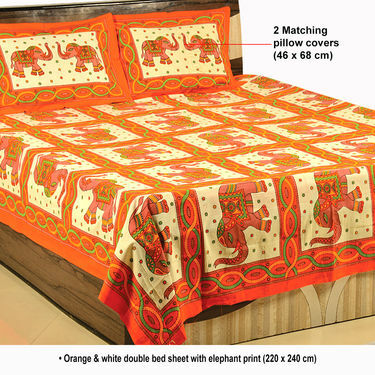 Introduce a sense of antiquity to your home decor with these Jaipuri printed bed sheets and bring the chronicles of old Rajasthani folklores into your home.The vibrant colours and exquisite designs will definitely add a lot of spark and style of your place. You can even gift your friends and relatives if you so desire. In my courier only First Double bed sheet was packed and in fine quality with Zipper pillow cover rest were packed together and 3 other bedsheets quality was not as first one and size were also not as big as the first shown in web. 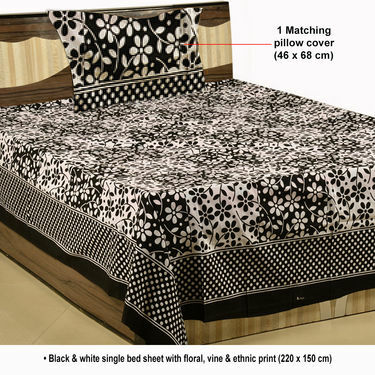 single bedsheets were with same bad quality without cover. I got refund voucher. if i order the same do i get the good qualities of bedsheets? If I don't like the product, then do I have an option to return? Will I get the entire money refunded ?? 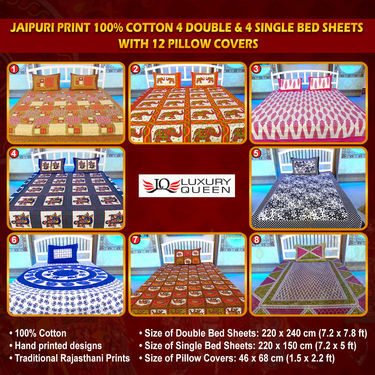 Jaipuri Print 100% Cotton 4 Doubl..VSSet of 5 Floral 3D Bed Sheets wit.. Jaipuri Print 100% Cotton 4 Doubl.. VS Set of 5 Floral 3D Bed Sheets wit..
Jaipuri Print 100% Cotton 4 Doubl..VSSet of 5 Nature's Love 3D Print B.. Jaipuri Print 100% Cotton 4 Doubl.. VS Set of 5 Nature's Love 3D Print B..
Jaipuri Print 100% Cotton 4 Doubl..VSPack of 4 Gold Print 100% Cotton .. Jaipuri Print 100% Cotton 4 Doubl.. VS Pack of 4 Gold Print 100% Cotton ..
Jaipuri Print 100% Cotton 4 Doubl..VSSanganeri 4 Double & 4 Single Bed.. Jaipuri Print 100% Cotton 4 Doubl.. VS Sanganeri 4 Double & 4 Single Bed..